2nd prize in the non-open facade competition with six participants. 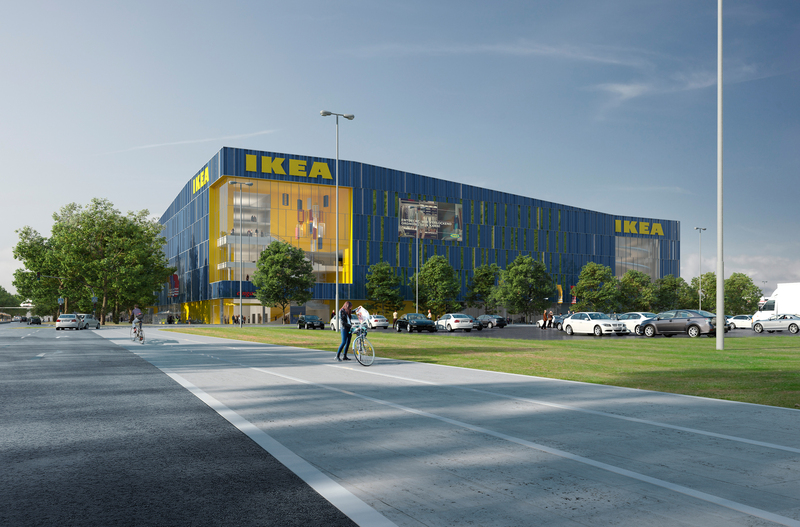 A new Ikea furniture store is under development on a 3 hectare plot of land in the eastern part of Karlsruhe. 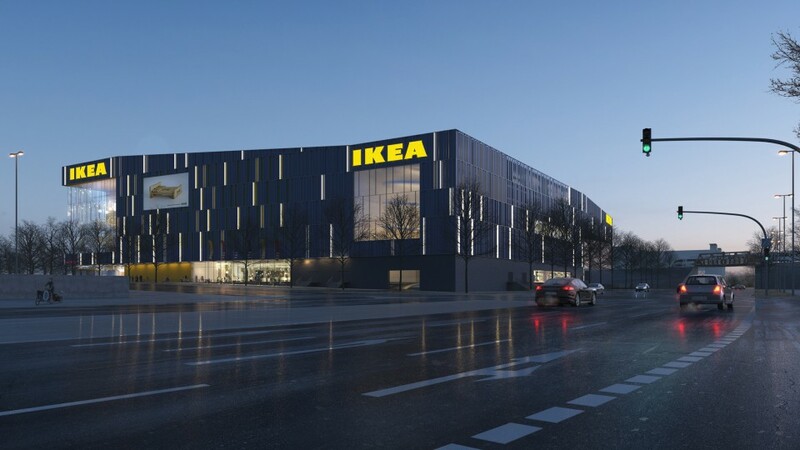 The aim of the competition for the facade design is to give the building an identity that combines IKEA’s corporate design with the urban context in which the building is set. The design envisages a highly recognisable, uniform structure, rich in diversity and proportionality, which acts as a strong representation of the upgrade to this area of the city. The outward projection of the slowly rising structure toward the main entrance reinforces the impact of the south and west facades. On the southern facade, the planned straight surfaces of the structure are omitted, with the facade instead at a slant, thus reducing the immensity of the structure and providing a roof over the main entrance area. The placing of an inverted, yellow entranceway highlights the main entrance and connects it to the entrances of the upper parking levels. The ground floor area is characterized by an open and transparent atmosphere, while the upper parts of the building provide a visual contrast to this. 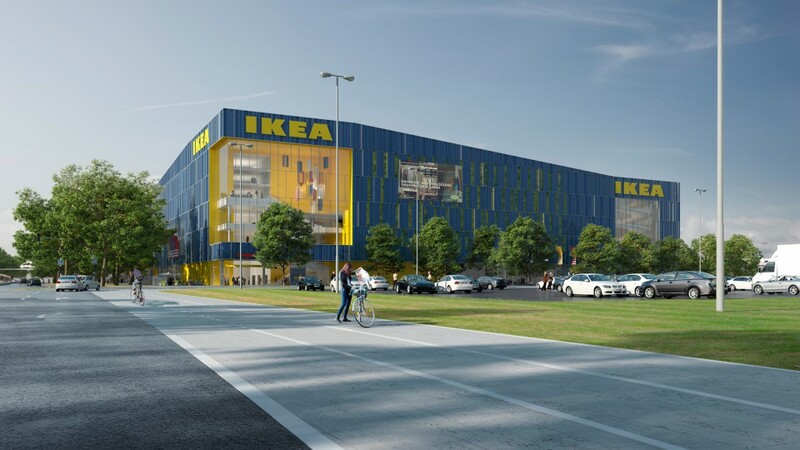 Based on a bar code, the facade of the upper floors consists of metal panels placed at varying distances to each other and coloured in the typical Ikea blue, contrasting with the neutral white of the recesses. Through the layering of panels of different depths, the structure is given a distinguished appearance when viewed from an angle. Depending on the viewpoint and the different shadows created by the slightly offset surfaces, the structure changes in appearance throughout the day. In addition, the recesses are fitted with light blades, which ensure that the facade also draws attention in the evening hours.